Psychologists had two goals when working on the Beautycheck project: to find out what beauty is, which features it has and to determine social consequences of human attractiveness, or how human looks influence other people. Young researchers photographed 96 volunteers (there eight models among them) between 17 and 29 years of age. Five hundred respondents of all age groups and social layers estimated the photographs on the 0-7 scale, in which “one” designated a less pretty face and “seven” stood for the most beautiful and attractive image. The majority of people will say that the faces depicted on these photographs are immaculately beautiful. The portraits were made with the help of a special computer program by German psychologists Martin Gruendl, Claus Marberger, Christoph Scherber and Christoph Braun. The researchers designed the images on the base of ideal proportions and features of human face. Applying one image on another, psychologists were amending facial proportions and the type of skin. Women's features, for example, were changed on the children's scheme: an enlarged head, a large curved forehead, a shortened nose, rounded cheeks and enlarged eyes. It turned out that children's proportions make an adult woman breathlessly beautiful. Even the most beautiful female model will think that she looks a lot better on a morphed image of her face, on which child's features had been added. The child-adult combination in the looks of a woman has a biological significance. The above-mentioned psychologists wrote in their work that men are subconsciously more attracted to younger women, for the latter possess a better child-bearing capacity and they can stay in their childbearing age longer than adult women. Not so many men find mature women sexually attractive: when a man takes a look at the face of a mature woman, the image signals him that this woman is not a child and she can become a mother. 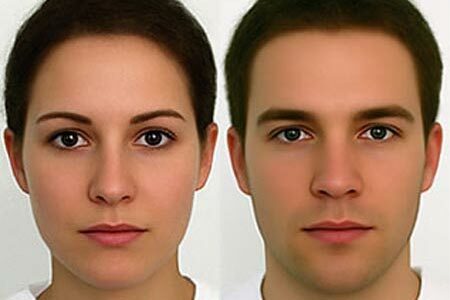 When the experiment was over, scientists summarized the basic selection of features, which should be typical to a good-looking face of a man and a woman. A female face is believed to be beautiful if it has: dark or tanned smooth skin, narrow face, full lips, large and expressive eyes, thin eyelids, thick, dark eyelashes and eyebrows. Handsome men are characterized with similar features, plus a resolute chin and an expressive lower jaw. Modern people with their standards of beauty run risks of losing the battle with perfect computer images and fall a victim to non-existent perfection. In addition, German scientists concluded that there was a certain stereotype in perceiving a beautiful person. People think that beautiful individuals are talented, creative and sensitive; that they have an ability to exert a positive influence on others. Those, who have not so pretty, or absolutely unpretty faces, are usually perceived as people who cannot boast of such qualities and traits – just an instant visual contact is enough to conclude so. Unattractive people are usually perceived as someone unhappy, malcontent, presumptuous, stupid and exhausted with their own lives. Social consequences of human appearances are enormous. It is easier for beautiful people to live on this planet. They are usually more successful in their private and professional lives, although it may seem to be absolutely unfair to others. All is not gold that glitters – this is the saying for those, who disagrees.